50 episodes into ModChat, crazy! We definitely plan to touch base on this milestone, but we of course have to have our modding topics as well. Some of this episode's topics include highlighting a few awesome Vita homebrew games from VitaHEX, a new GTA patch from TheFloW, Switch controller support in Chromium, and more! Stay tuned. 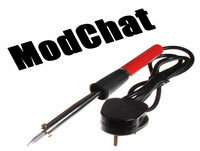 ModChat 047 - PlayStation Classic Mods, Nintendo vs. Soulja Boy, Drunk End of the Year Q&A!